NCTE 4 years integrated BEd course, NCTE BEd course with intermediate Qualification, NCTE 4 years Integrated Teacher Education Program (ITEP), Applications are invited from the eligible candidates composite institutions for start of ITEP course. Grant of Permission and recognition to 4 years Integrated Teacher Education Program (ITEP). 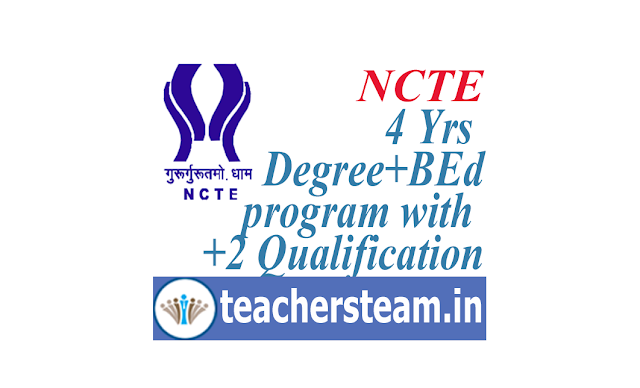 The National Council for Teacher Education (NCTE), a statutory body under Ministry of Human Resources Development has been established under an Act of Parliament (73 of 1993) with a view to achieve planned and coordinated development of teacher education system and maintenance of norms standards and matters connected therewith throughout the country (except Jammu and Kashmir). It proposes to launch a 4 years integrated Teacher Education Program(ITEP), for which entry qualification is 12th standard with 50% marks. the ITEP imbibes some of the best practices of teacher education in the world and aims to bring about a qualitative change in preparation of teachers for the school system. NCTE invites online applications from COMPOSITE institutions from 03-12-2018 to 31-12-2018 for grant of recognition, permission to 4 years Integrated Teacher Education Programme (ITEP) for the academic session 2019-2023. The Applicant institutions which do not qualify as per clause 2(b) of NCTE Regulation 2014(supra), shall be treated as ineligible and their applications are liable to be rejected and processing fees paid by them may be forfeited. In case of any clarifications, the applicant institutions may get in touch with NCTE officials on the following mobile numbers during office hours.